I just got a super swanky chenille bedspread on eBay for 10 bucks, I think I'm going to go celebrate. Woo! so awesome i can hardly believe it! wow- he looks fantastic! It's a great size- has an eerie human quality to it, just sitting there. This is turning out so well. I have to laugh about the loaves + fishes because I have very little knowledge about The Bible + any time a Bible reference comes up that I don't get I always ask my sweetie if it has anything to do with loaves + fishes. He always sighs + says, "no, that's another story." I love the colors you chose. Really lovely! 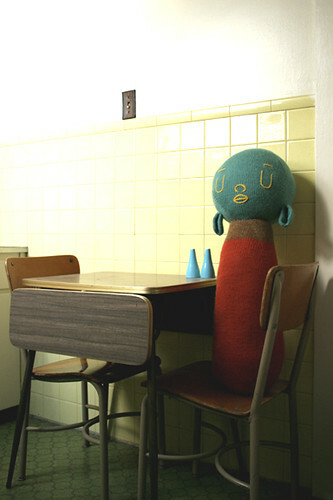 For some reason, I hadn't imagined you where knitting the Big Head and Big Body. It looks fantastic! I actually really love it with out arms and legs! I think you should keep it as a pole body. Uh, the Big Body is truly GREAT. What a fun project! Only a skein and a half? Wow. Anyway, it looks great! That is amazing. Please tell me you are going to exhibit him somewhere. He's to awesome not the share with the whole world! WIll you share the site you got the bedspread from? I loved robot. Big Body looks like a wonderful companion to have a cup of coffee with! That Lamb's Pride is a little magical isn't it? How the heck can I get one of your knitted robot books? He somehow reminds me of some beaded dolls I saw in S. Africa. Gorgeous colors. I think he wants a cup of coffee. Cream,no sugar. I came her from Fricknits website. You should sell Spherey again! We all want to make him for babies to come! Please! I love everything about this guy...and where he's sitting.